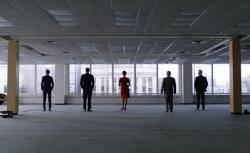 Mad Men recap: Season 5 in review and the Slate TV Club says goodbye. So long from the TV Club! That’s a great point, Julia, about Mad Men’s characters learning this season that they’re not necessarily in it together. Don getting propositioned by that woman at the end of the episode seemed at first to have ominous implications for the season to come. But her choice of words has great resonance for the season that’s just ended. Are you alone? How many of our heroes can answer that in the negative? Peggy had to strike out on her own to find the recognition she believed she deserved, leaving her erstwhile pact-mate, Ken Cosgrove, to fend for himself. Joan divorced her husband and turned down the help of her baby’s father. Roger has lost the happiness he enjoyed after his first LSD trip; last we see of him, he’s trying to recapture it—but by himself this time, having divorced Jane. As you noted, Julia, Pete seems to have discovered a sadness he can’t share with anyone save Beth Dawes—but she no longer remembers him. In the episode’s final montage, everyone is alone. It’s a pretty grim state of affairs. And yet, there were also wonderful moments of connection this season. Don’s chaste night out with Joan, in which he revives her spirits and confides his affection and respect for her. (And earlier, the tender exchange between Lane and Joan, in which he reassures her of her indispensability to the firm.) Don and Peggy’s run-in at the movies, unlikely as it may have been, in which Don seems at peace with the fact that his protégé has moved on, observing that this is the natural order of things, and wishing her well. (And surely taking some pride in the fact that his lesson about how to clear out the cobwebs stuck.) The scenes between Betty and her daughter after Sally gets her period—for all of Sally’s complaints about her mother, she still needs her in that moment, and Betty, for once, is there for her. We may all have to rely on ourselves in the end, but it doesn’t mean that we’re always alone. Colleagues, friends, and parents occasionally come through for these characters, often when they’re most in need, and these moments keep the series from getting too bleak. I’m grateful for that. I’m also grateful for having had the chance to discuss this terrific season with the two of you. I am so not bored of this dynamic, but the TV Club has to box things up for now so the contractors can start putting in that new staircase. Thanks to you both, and to all of our readers for their thoughtful and energetic comments over the last 12 weeks. Prediction: Season 6 is all about race.